Altrincham Vintage Market is one of our favourite places to pick up new items for our collection of vintage china. We were delighted to find this amongst the many treasures the market had to offer last Sunday. A little ‘Sadler’ vintage teapot…pretty blue flower design with ridge detail around the lower half of the teapot…gorgeous. 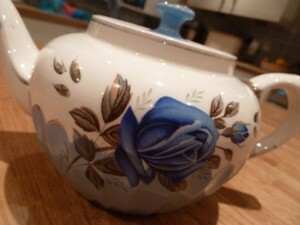 This one will be making an appearance at one of our vintage tea-parties very soon.